Todays Metro’s weekly flyer we have a lot of opportunities. Fresh vegetables and fruits. In Metro you always finds most freshest, high quality products and good prices. With these fruits and vegetables you keep your body and your mind healthy. Specially this cold and windy winter days. You can catch a cold in unaware. If you want to keep ilness away from home you need these vegetables in your home. Let’s look together what we have in today’s flyer. Broccoli is one of the healthiest food in the world. I know the taste of broccoli is not good, especially for kids. But in internet or cooking book you can find delicious recipes. You can prepare delicious broccolis for your family. Mini sweet peppers you can add your meals. These peppers are product of Mexico. They are not hot, so they will safe for children. Seedless Navel Oranges are juicy and tasty. You can eat or in home you can make orange juice also you can cook with them orange cake. It will be very delicious. Also in Organic Section you can find organic bananas, avocados, cauliflower and more. Yves Veggie Cuisine, Veggie Chicken Tenders are available in Metro. Bolthouse Protein Plus Chocolate Smoothie is tasty. 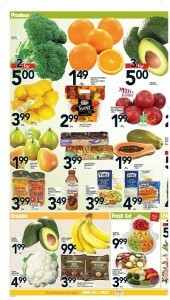 Metro flyer also you will find lemons, Red Prince Apples, Anjou Pears, Jumbo Papayas, Black Mission or Calimyrna Figs. Fresh cut vegetables and fruits also in Metro stores.